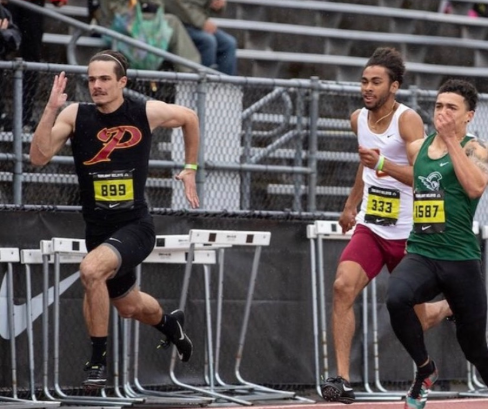 It was a matter of seconds as Nolan Mickenham dominated the Tiger Invite, taking first in the 100m and 200m, as well as contributing to a 4x100m relay team that also took first place. A senior, Mickenham is looking to show out after placing 3rd in state for the 100m and 8th for the 200m last season. Not only did he place first, the track star also garnered a personal record for both of his individual events. But more importantly, Mickenham managed to take home an award for Outstanding Athlete as he broke the meet record time for the 200m dash. Mickenham’s running can be affected by many things, but he says, “sometimes I feel really good and that’s when I PR and do really well.” He also mentioned that he’s affected by mainly weather and his own health. Mickenham says he looks to his want to be, “the best athlete he can be” when seeking for motivation. This was key in a long offseason of training that has fueled Mickenham’s incredible results. The next track meet is Thursday, March 28th, as Prairie will face off against Evergreen at home.